Are close H…H contacts bonds? The dénouement! cis-Butene: a reaction coordinate dissected and methyl flags. In two previous posts, I have looked at why cis-butene adopts conformation (a) rather than (b). I suggested it boiled down to electronic interactions between the methyl groups and the central alkene resulting in the formation of a H…H “topological” bond, rather than attraction between the H…H region to form a weak chemical “bond“. Here I take a look at what happens when that central C=C bond is gradually removed. Two possible conformations of cis but-2-ene. One reaction that removes this bond (marked with a magenta arrow below) is the Diels Alder π2s + π4s cycloaddition to a butadiene. An intrinsic reaction coordinate for this reaction looks as below: the barrier is around 25 kcal/mol and the reaction is exothermic (SVG compatible browser needed to view figure). Watch first the butadiene component. Its resting conformation is gauche rather than eclipsed at the central C-C single bond, with the two double bonds rotated slightly to avoid (in this case) a close H…H contact. 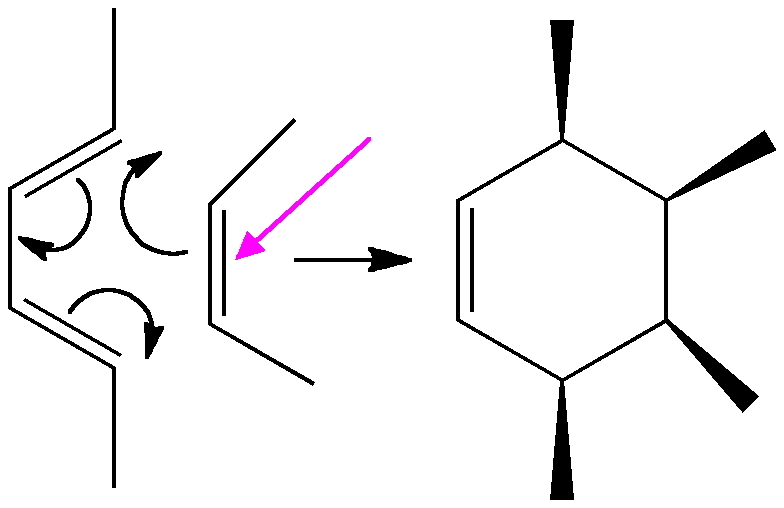 The first step in the reaction path is to rotate the butadiene from this gauche orientation into a eclipsed conformation at that bond. Next, the action takes place on the cis-butene. Unlike the diene, it starts off eclipsed (due to the effects noted previously) in conformation (a) above, but as the alkene starts to weaken (and the electronic effects holding it in this shape lessen), the two methyl groups rotate into conformation (b). In effect, the electronic reorganisation has moved the close H…H contact from the alkene to the diene! Finally, the two C-C bonds can proceed to form, and the rest of the reaction proceeds to form the cyclohexene product. Keep an eye out as well for the two methyl groups on the butadiene. Watch how they too rotate near the final stages of the reaction. Geometric responses to the cycloaddition reaction. I have observed methyl groups in a number of reactions now via intrinsic reaction coordinates, and they do seem to be acting as flags, highlighting subtle effects in the electronic reorganisations. Rotating methyl groups should be looked at more often as harbingers of interesting effects! This entry was posted on Wednesday, October 12th, 2011 at 8:16 am and is filed under General, Interesting chemistry. You can follow any responses to this entry through the RSS 2.0 feed. You can leave a response, or trackback from your own site. 1. Did you impose symmetry constraints on your IRC? 2. Are you aware of Houk’s torsional steering concept? The methyl rotations look like they might be consistent with his analysis of conformational changes during cycloadditions. See DOI: 10.1021/ol061085x for an example. 1. The IRC starts at the transition state, which does have formal Cs symmetry. A full Hessian is then calculated, and repeated every 10 steps. Down one side to butadiene, the global symmetry breaks to C1 (i.e. it is not imposed) as the butadiene twists into a local C2 symmetry. So symmetry breaking can and does occur, to answer your question. I might add I have other examples involving two methyl groups, where one methyl group rotates before the other (in the example in this post, the rotations are synchronous). I do not yet know if asynchronous vs synchronous methyl rotations are significant, and what the origins of the differing behaviour might be. 2. Yes, although I have only read it for electrocyclic reactions. Has he also demonstrated it for cycloadditions? I know Ken has also done full molecular dynamics simulations, which should certainly factor methyl rotations in. How can I let Gaussian perform a PES for a Diels-Alder reaction, i.e. how can I let the C atom pairs of two new forming approach simultaneously? If I used modredundant on both C atom pairs Gaussian only shortens one of the bonds, then optimizes, then shortens the other one, optimizes, etc. But this isn't useful. A constrained PES based on two bond lengths is perhaps not so useful. Far better, I think to locate the transition state by whatever mechanism. I simply constrain the two forming bonds to ~2.2A using a modredundant command, refine the approximate TS using an opt command, and then compute the PES as the last (rather than first) step using the IRC command. One can try a two dimensional scan by specifying each bond separately. This should then give a 2D surface which can be eg contoured or isometrically projected using suitable programs. I used to do this years ago, before IRCs were available, but have now entirely abandoned this approach. Thank you for your prompt reply. As part of a project we are supposed to compute the PES of a simple Diels-Alder, but it doesn't work because Gaussian cannot shorten to imaginary bonds simultaneously as you described. So I wonder what they did you in this paper (http://www.jmcs.org.mx/PDFS/V57/4/02%20K.%20Ramirez.pdf)? They called it a PES, but is it actually a IRC? You ask if it might be an IRC rather than a constrained PES (by constraining BOTH bonds simultaneously, one makes an assumption that they both change at the same rate, which is a very dangerous one to make. An IRC does not make this constraint). An obvious way of checking EXACTLY what was done would be to inspect both their inputs and outputs. Unfortunately, this information is almost never provided! What does tend to be provided is SI containing the coordinates of eg a TS only. I again make the case that in an era of extended SI or RDM (I call it FAIR data and the method RDM, or research data management), one should include the parameters that define the job (via the input file), the actual outputs (in several forms) AND a convenient set of coordinates for key critical points. This makes it really easy for others to find out what was done, and to replicate the work if necessary. Then to make it properly FAIR, a DOI and metadata is added. Whilst this method is rarely adopted at the moment, I venture to predict it will indeed become the norm in just a few years time. Thanks for the additional information re: asynchronous rotations. In that case the methyl would be ‘flagging’ something other than an H-H interaction between the vicinal methyl groups. As for Ken Houk’s work, the article I referred to shows cycloaddition transition states. I don’t recall any mention of them following torsional steering along the full IRC. Your analysis is a nice extension of that idea. The variety of situations in which electron pairs create torsional strain is quite interesting. These TS and IRC examples suggest that an electron pair can be delocalized and create torsional strain as long as it also creates a sigma bonding interaction. There is probably something more fundamental going on, don’t you think? Yes, that was my point, the rotation of the methyl flag was suggesting deeper electronic reorganisation in the C=C region, rather than the H-H region. Torsional steering is of course on the rotation of the Me-C-C bond, whereas I was talking more about rotation along the H-C-C bond, so its not quite analogous. As for something fundamental, yes, it will be worth exploring some of the other methyl rotations I have found. And the effect does seem to be quantifiable using NBO E(2) energies. cis-Butene: a reaction coordinate dissected and methyl flags. is licensed by Henry Rzepa under a Creative Commons Attribution-Noncommercial-Share Alike 3.0 United States License.